This campaign has concluded, but if you would like to still make a gift to support the Lied Center, please visit www.lied.ku.edu/donate. Make an impact on our youngest performing arts’ lovers. Your donation will help fund the Lied Center’s Performing Arts 3to5 for the next three seasons. 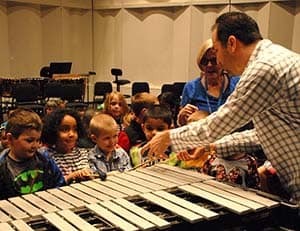 This program brings area preschoolers to the Lied Center stage for a performance interaction, created especially for them by a world-class artist. Performing Arts 3to5 is one of the first performing arts opportunities these preschoolers experience. It introduces them to instruments, song, dance and music in a fun and accessible environment that lays the foundation for a future rich in the arts and learning. Studies have shown that performing arts experiences early in life affect the academic achievement and social development of children and youth. Thank you for supporting the youngest members of our community. A gift of any amount is always appreciated. Click "Contribute" and type in the amount you desire! Help us bring preschoolers to the Lied Center to experience the performing arts LIVE! Enjoy Friends of the Lied opportunities at the Advocate level. Join us on stage for the 2016-17 Performing Arts 3to5 performance. Enjoy Friends of the Lied opportunities at the Contributor level. Invite 5 of your friends to join you on stage for the 2016-17 Performing Arts 3to5 performance. Enjoy Friends of the Lied opportunities at the Sponsor level.